If you know me you know I like espresso and cognac (brandy when I am cheap) and sometimes I combine them in different ways. I also combine coffee and cycling quite a bit. Well the other day while searching one of them bartending apps on the phone I found the regular jello shots the wife loved so much when we first meet. Now you see where I am going with this right? I have had caffeine mints on some on the longer randonneuring events to help me stay alert at night but the pills are not the same as the real thing. Coffee has that bitter taste that I like. Add all of them to a bowl and boil for a minute. Pour in an ice tray. Wait until the gelatine is ready and then enjoy. Now don't go riding after eating the "brandy enhanced" jello shots. 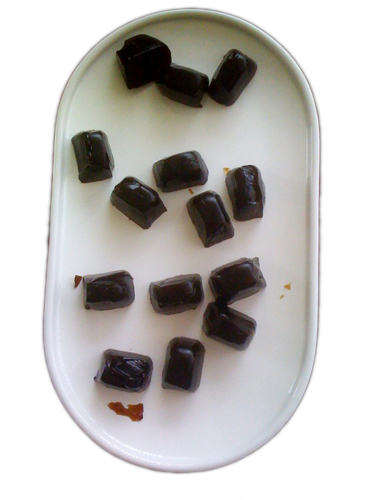 But the plain coffee jello shots should be easy to carry in a ziplock bag or even inside a water bottle.